The other night, I left the bathroom door ajar as I was brushing my teeth and my dog startled me when he pushed it open to see if I was inside. I laughed, with a mouthful of toothpaste, and gave him a pat on the back before returning to the sink. 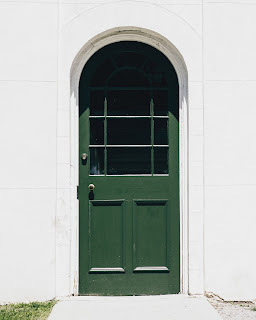 And being the reflective thinker I am, it got me thinking about doors and how I have a really hard time closing doors in my life. I've mentioned it time and time again, but if I've got a really good book on my nightstand, it'll likely stay there for months because I hate finishing books. And let's not talk about how I put off finishing the first season of Gilmore Girls' Year in the Life for an entire year because I didn't want to watch the last episode (the last thirty minutes to be exact, haha). Or how much I dreaded any last episode of a television series (namely Parenthood). But it's not just books and TV series. It also goes for the stages and experiences and people in my life, too. No matter how much I try, my heart goes back to remembering and savoring the memories. I blog, for goodness' sake. I write to document life experiences, thoughts, and seasons and will spend time leafing through my old journals and blog posts as the years go by. I'm grateful for it all, the ability to write, the platform to share, and the space to create. But I still struggle with letting go--once and for all. And if I dig a little deeper, I think a lot of it is rooted in fear. Fear of the unknown. Fear of the future. Fear of surrendering and giving up control. My hands are gripped, figuratively speaking, on the past because the future is scary. My hands are clenched because the idea of losing control is even scarier. I hold onto the past as tightly as possible because it's familiar, even if it's not what's best for me. But does it have to be that way? Do I have to see the future from that perspective? My gut reaction would be yes, but I know that's not the godly reaction I should have. I don't have a solution yet. I don't have an answer. To be honest, I'm still wrestling with this. Still praying fiercely about this. Still trying to let go and surrender. And still remembering that I don't honestly have to have it all figured out. Sometimes it just takes a whole lot of faith, a whole lot of prayer, and a whole lot of Jesus to realize I'm not the perfect One. He is. And that sometimes, it's not just a matter of closing doors, but opening new ones and letting Him in.